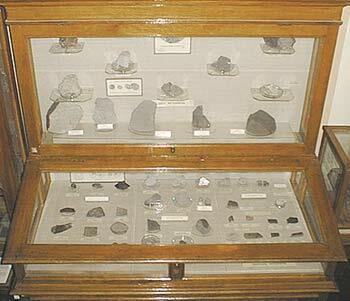 The out-of-earth mineralogy represented in the museum on the meteorite exhibit at the beginning of museum hall. You can see here a valuable part of the Russian academy of science meteorite collection - one of the most important meteorite collection of the word. This collection includes samples of more then 447 falls including about 158 falls on the former Soviet Union territory. The first specimen of this collection was a piece of iron-stone meteorites called "Pallasovo Zheleso" (Pallas's Iron) discovered by one of former directors of the museum - academician P.S.Pallas (1741-1811) in Medvedevo village, Kranoyarsk region, Siberia during one of the Great Siberian expeditions. The meteorite itself was found in 1749 by a local smith who was going to utilize the good meteorite iron. It took ten years for delivery by horse a piece from Siberia to Sankt-Petersburg. Finally the 687 kg lump had arrived tomineral cabinet in 1772. Later the whole piece was cut to two parts which you can see on the exhibit together with the natural size gypsum model of uncut piece. The name "Pallas Iron" was given to that meteorite by academician E.F.Chladni (1756-1794). He founded the piece turned out to be an olivine and nickel iron mixture. The mineralogical composition of the piece was very different compare to earth stones so E.F.Chladni suggested the piece came from the sky. Studying that stone E.F.Chladni made a significant contribution to the meteoritic science. After him all meteorites with the composition and structure similar to "Pallasovo zheleso" (containing about equal amounts of olivine and nickel-iron) were given the name "pallasites". Above this show case the picture placed showing the falling of Sikhote-Aline meteorite. It was painted by a lucky artist Medvedev who just set up his easel near Iman village and begun sketching when unexpectedly the flaming fireball appeared on the sky. This is the only picture in existence of astronomic event. 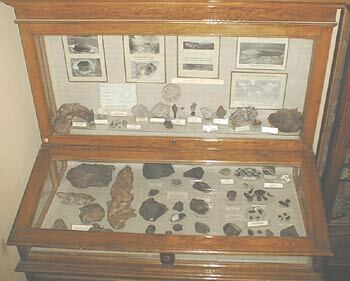 Some of the evident results of meteorite fallings as damaging houses, trees and other displayed in the case. 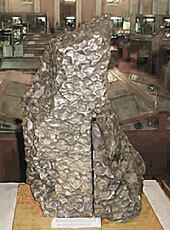 For example, the 384gr part of Kunashak meteorite (fell in 1936) displayed with the part of the tree where it stacked. At the same year Yurtuk meteorite 1.5kg fell down to the house roof. Another case (below) demonstrating more significant disintegration causing by meteorites such as meteoritic craters and some specific rocks associated with meteoritic impacts. The samples of impact rock sometimes even containing valuable quantity of diamonds as it's known for example in Popigay crater in Siberia. pieces is Chinge meteorite found in 1912 in Tuva, Russia. The pictures of big craters shown - Arizona crater in USA, Kaaliyarv in Estonia and others. The geography of Sikhote-Alin' meteoritic shower falling and it's material represented in a separate case. This is the biggest meteoritic shower the people ever directly observed. Although this is not the biggest among known. For example in 30-es years of lust century the iron masses of Gibeon meteoritic shower were found in South Africa. This event supposedly had happened about 20000 years ago. Many hundred tons of iron fall down at that time. By weight of pieces found Gibeon more than Sikhote-Alin' as minimum in few times. The falling of Sikhote-Alin' took place by February 12, 1947 in west part Sikhote-Alin mountain range. Approximately about 100 ton fell down. The number of separate pieces - couple hundred thousands. The bigger pieces caused 24 craters with diameter to 30 meters and a number of smaller holes. 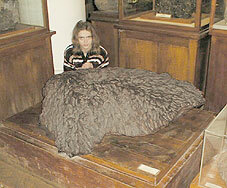 The biggest piece found (1745 kg) on the podium in museum meteorite section. 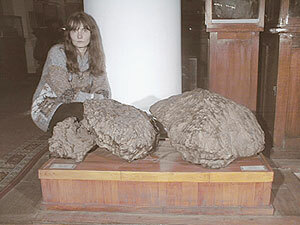 The biggest Sikhote-Alin individual piece 1745 kg. Smaller drops of Sikhote-Alin's shower. It was possible to see (and hear) the flaming fireball before the fall in about 180 km radius. This bolid was moving through NNE to SSW. This is the direction of the meteorite material spreading. The size of spreading area is about 12 x 4 km. The head part of this area is the craters field. As for now about 26 ton in more than 6000 pieces of meteorite material were collected . 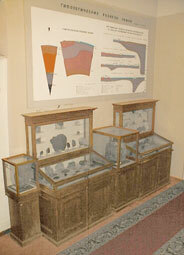 In the following part of exhibit the mineralogicalcomposition and structuresof meteorite are demonstrating. 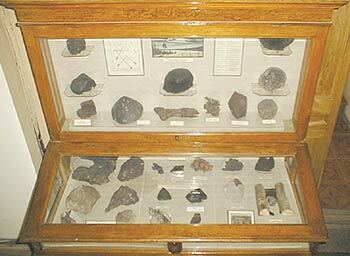 The exposition covering nearly all classes and types of the meteorites. The studying mineralogy of the material from space revealed the fact of close similarity mineral species and associations of deep parts of the Earth. Many mineral species, originally discovered in meteorites were found soon on the Earth. Just a few species exclusively known for the meteorites. The meteorite mineralogy relatively poor compare to the Earth. It's known less than 200 mineral species in space matter and more than 4000 species currently known on the Earth. The most common meteorite mineral is the native iron alloys - kamasite, taenite and others. Among silicates more common olivine and pyroxenes. 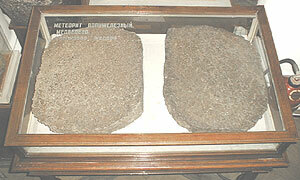 For example Sikhote-Alin' meteorite mostly consist of kamasite (cubic FeNi) with small quantity of taenite (cubic NiFe). Accessory minerals are schreibersite (Fe,Ni)3P, troilite FeS, chromite FeCr2O4, daubreelite FeCr2S4, cogenite (Fe,Ni,Co)3C. Silicates found as rare inclusions. The chemical composition of this meteorite in bulk is(%): Fe-93.32; Ni-5.71; Co-0.48; Cu - 0.011; P - 0.28. In the meteorite Noviy Urey the diamond is found . In meteorite Staroe Boriskino were found water containing silicates of chlorite and serpentine groups. 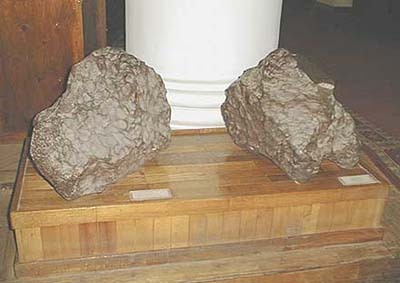 Depending on mineral composition the meteorites divided to iron meteorites, stony-iron meteorites and stone meteorites. The subdivisions in those classes are defined by meteorite structures or minerals. The structure of iron meteorites could be highlighted using the etching of meteorite polished surfaces in strong acids. After the etching the Widmanstatten (after the name of it's first describer) figures can appear. According the 3D shape of the developed plates the iron meteorites dividing to octahedrites, hexahedrites and ataxites (fail to show any obvious structure). The farther subdivisions are according the size those plates (lamellas). For example Sikhote-Alin is a coarse structured octahedrite, and Gibeon, Namibia is a fine octahedrite. A big cut plate of octahedrite Mundrabilla (Western Australia) was presented to collection in 1966 by professor P.Ramdor. Among hexahedrites on the exhibit is Broumov fell down in 1847 in Czech. One of the most beautiful iron meteorites is kamasite hexahedrite Boguslavka. It's Russian fall in 1916 represented in museum by the piece broken during the fall on two parts 198.6 and 58.1 kg. Those parts are the fragments of one crystal of kamasite ! . It's belonging to hexahedrites was proved on other samples of this fall. Another extremely rare stony-iron type called Siderophyre and consist of taenite and orthopyroxen. The most usual minerals in stone meteorites are olivine and pyroxenes. The common accessory minerals are plagioclases, NiFe alloys. Quartz, amphiboles, micas, serpentine, chlorite, troilite are rare minerals. The maine subdivision of stone meteorites is according to it's structure to chondrites and achondrites. Chondrites are the most common type. It's name came from small spherical inclusions called chondrules. This texture not found in terrestrial rocks. The chondrules's average size is 1 mm, rarely up to 5-7 mm. Chondrules different in structure but have the same mineral constitution as surrounding masses. The genesis of chondrules is unclear. By mineral composition the maine chondrite's subdivisions are ordinary (olivine-bronsite-hypersten), enstatite chondrites and carboniferous chondrites. Achondrites as it's clear from their name have different texture. As it's proposed achondrites formed by melting and recrystalisation of parent chondritic bodies. The structure of achondrites more close to terrestrial's rocks. There are a number of subdivisions of achondrites according it's mineralogy. The short excurs to meteorite classification had to be done since the rest of the museum meteorite exhibit in show cases and podiums arranged according it's classes and in chronological (the year of the fall) order inside classes. Among meteorites on exhibit are the main masses of many Russian falls and a number of meteorites remarkable by it's structure and composition (Nechaevo, Shassin'i); by it's size and shape (Kashin, Kainsaz ); by the time of the fall (the part of Ensisheim chondrite first recorded fall in 1492) . There are represented valuable parts of meteoritic showers Kunashak, Chinge and others. 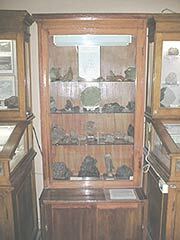 Click the active areas on the photo to see showcases in more details or go to the meteorite part of image gallery to see the images of most interesting specimens. The big scheme of the Earth's structure hanged above the showcases to remind that although the meteorites falling from the sky they are helping to study internal Earth's zones. As it's supposed to be the iron meteorites are the parts of the planets core , stony-irons and chondrites are respectively the parts of lower and upper mantle of the planets and achondrites - the planet's crust. The classification schemes above were based on easily recognizable features, but modern analytical tools and methods based on chemical, isotope and structure analysis gave possibilities to develop really scientific classifications which are giving the key to learn Earth's history. Indeed the meteorites are the most old matter we can met. The age of most iron meteorites is about 4.5 milliard years. They are as minimum twice older of the any most ancient earth rock. Some of meteorites may be even older (to 7 milliard years). They may e represent the other planet systems. Finally recent contributions in finding organic compounds in meteorites are giving the base to suggest the meteorites could be the source of life on the earth.